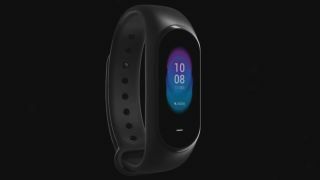 Interest in the budget friendly Xiaomi Mi Band 3 has been fervent after it launched earlier this year, and now the company has announced another wrist based device to go alongside it. The Xiaomi Hey+ has just been announced on a Chinese crowdfunding site called Youpin, but it has already reached its crowdfunding goal so will be produced and sold by the company. It has an affordable price point at 229 yuan (about $34, £26, AU$45) which is a touch more expensive than the Mi Band 3. The specs are remarkably similar to the Mi Band 3, but instead of the 0.78-inch display you'll get a larger 0.95-inch screen on the Hey+. It's only a touch bigger, but the resolution is better on the Hey+ at 240 x 120 compared to the Mi Band 3's 128 x 80. Xiaomi + Hey = ? The new tracker also comes with a color AMOLED display, while the Mi Band 3 is a black and white LCD screen. It'll also come with NFC support, like the Mi Band 3 does in China, as well as tech to record your step count, calorie burn, sleep and some certain exercises too. The thing to bear in mind here is there's currently no word on an international release. You can buy the Mi Band 3 in the US and UK through websites that import it to those markets, but it's not officially on sale in either of those places directly from Xiaomi. It may mean we never get to see the Xiaomi Hey+ fitness tracker in other markets around the world. You may have to settle for the slightly smaller Mi Band 3 instead, but if we hear about a worldwide release for the Hey+ we'll be sure to write about it. Below you can watch an introduction video to the Hey+.